Oval Magnetic Stirring Bar is offered in various dimensions and customizable as per the requirements of clients. We do full inspection of the offered range to ensure that clients are fully satisfied from our end. Made of Ptfe. 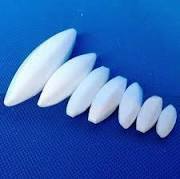 Magnetic Stirrer Bars : PTFE Coated stirring leakproof polished seamless bars / rotors / paddles with center ring for use with magnetic stirrers contain a permanent alnico V magnet with center ring. We are one of the best manufacturer of PTFE Magnetic Stirrer Bar. D8xL19mm Octagonal shape with Pivot Ring. Our Teflon is moulded and single piece, and can take easily 325°C temperature and Inside magnet is permanent magnet and its magnetic power intact upto 550°C temperature. Emerging supplier of PTFE magnetic stirrer bar.